Damon & Elena. . Wallpaper and background images in the Damon & Elena club. This Damon & Elena fan art might contain चित्र, headshot, closeup, हेडशॉट, क्लोज़अप, मोबाइल फोनों के लिए, हास्य पुस्तक, मंगा, कार्टून, एनीमे, कॉमिक बुक, and manga. That's the main reason why I really don't like Stefan and why I don't buy the whole 'Defan' crap. amen!!! DEFAN my arse!!! 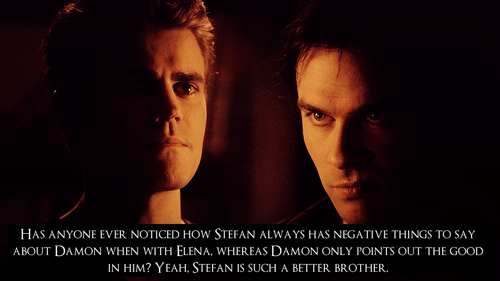 stefan doesn't care about damon, if he did, he'd have good things to say about him just like damon does with him!! he's a selfish , arrogant, DOUCHEBAG!!!! and i honestly don't care who knows it!!! TEAM DAMON FOREVER!!! !